There will be a Gallery Reception on Friday, March 26, 2004 at 4:00 p.m. All are welcome. This two-person exhibit features the work of artists who share teaching experiences, though at different times, at Bethany College in Lindsborg, Kansas. Caroline Kahler is currently an associate professor of art, art department chair, and Mingenback Distinguished Professor of Art at Bethany College. She holds a bachelor of science degree in art education from Kutztown State College, a master of arts degree in creative arts/textiles from Purdue University, and a master of fine arts degree in ceramics from Wichita State University. Her work has been included in several national and regional exhibitions and she is a frequent juror for arts festivals and exhibitions. Her many awards include a master artist grant from the Indiana Arts Commission, one of only four given in the state. 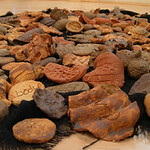 "The ceramic sculptural work reflects my continuing dialogue with objects that are reminiscent of the natural world. My artwork is used metaphorically for the expression of life cycles. The ceramic pods function as vessel forms. They symbolize human needs such as nourishment, reproduction, death and renewal and they speak to the transformation of a living organism. The ceramic process is one of transformation and it possesses its own life cycle: dust, wet, dry, bisque, glazed and vitrified. These various stages provide opportunity for many divergent events to occur in the life of a piece. My ceramic work is mostly high fired to cone 10, stoneware paper clay, with stains and glazes used to enhance the textured surfaces. In some of my latest work I have been combining fiber not only within the clay body, but also on the surfaces of the forms. These pieces are connecting the fiber as an integral part of the object and idea. They are process-driven and each new piece stimulates ideas for the next. I respond to the texture, color and material shift of combining these two processes as one and see this as a direction for endless investigation. I like working in a series and this is reflected in my newest work, a series of "spirit vessels" called Pod Goddesses that possess human characteristics within the pod forms. These pieces have appeared in my drawings for sometime and are very autobiographical. Not unlike the clay, they are my life cycle and reflect my spiritual connection to my mother and my daughter. "Strange Fruit, Seeds of Liberation" is the first installation piece that I have created using clay. I have been inspired by the jazz classic "Strange Fruit," particularly the expressive strength of Billie Holiday's voice. Historian Darlene Clark Hine notes "while the lyrics capture the brutality of lynching, it was Holiday's incomparable vocal style and delivery that gave the song its political, emotional, and cultural power." From brutality and death can come resurrection; from "Strange Fruit" can come "Seeds of Liberation." I want my art to belong to all who want to stand up for justice and humanity. 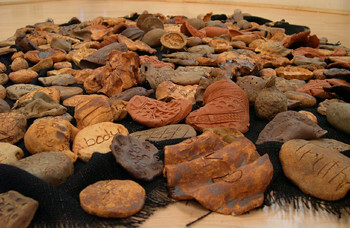 I have asked the students, staff, and faculty at Bethany College to create seeds of clay that speak to their feelings about the horrors of social prejudices or the possibilities of freedom. I invite the Luther College community to share in this endeavor." Dan Mason currently teaches at North Hennepin Community College in Minnesota. He earned a bachelor of arts degree from St. Olaf College, and both a master of arts and master of fine arts degree in drawing and painting from the University of Iowa. From 1969-82 he taught at Bethany College and served as art department chair during much of that time. 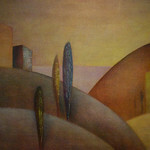 His work has been widely exhibited and he has created numerous commissions. Collections with his work include the Frederick R. Weisman Art Foundation, Los Angeles, and most of the prominent public and corporate collections in Minnesota. He is the recipient of a McKnight Foundation Fellowship. "The paintings in this exhibition present landscape and architectural settings that are radically simplified to express an underlying geometry and sense of order. The architecture is reduced to rectilinear forms and the landscape to arcing hills, columnar trees, and the distant ocean horizon. I am interested in creating a sense of places which are apart from the everyday, that suggest sacred sites, temple precincts, city squares and landscape vistas. 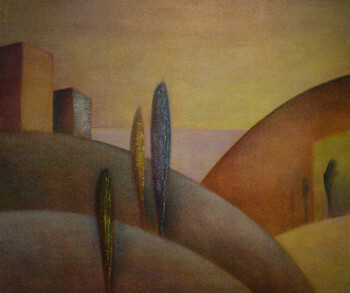 The paintings are also experiments with volumetric form, color, texture and light. The forms are defined, and the colors developed, by laying down oil color in layers of transparent glazes. Each color applied is conditioned by the colors beneath it, and gradually a sense of depth of form and complexity of color develops. The support is linen, which is chosen for the variety of surface textures the material makes possible."